Is Traditionalism a Spiritual Malady? Should It Be Curtains for the Rood Screen? Perspective Without A Vanishing Point? 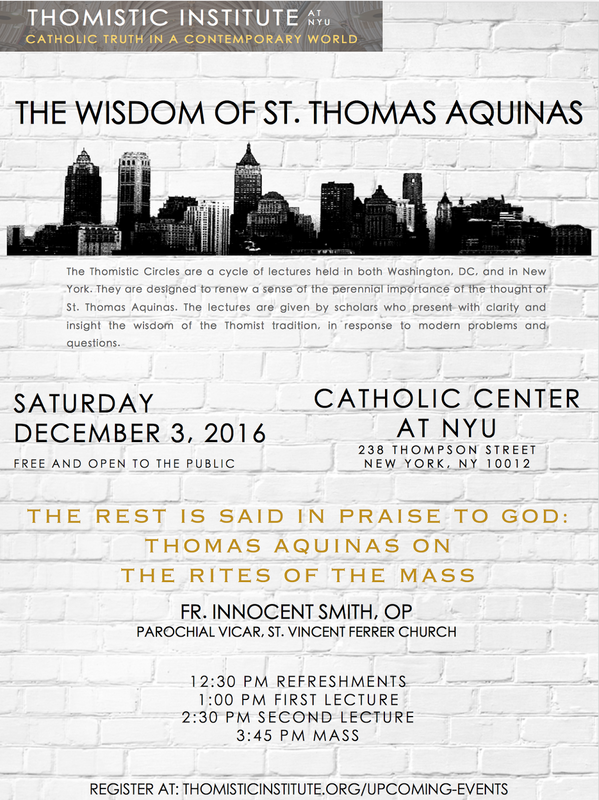 On Saturday, December 3, at the Catholic Center at New York University, Fr. Innocent Smith, O.P. will give a set of lectures titled: “The Rest is Said in Praise to God: Thomas Aquinas on the Rites of the Mass.” Throughout his writings, St Thomas Aquinas offers profound insights into the liturgy that draw on the thought of his predecessors while offering new insights into the mysteries of the Church’s liturgy. These lectures will draw on the commentaries on the Mass that may be found in his Scriptum on the Sentences of Peter Lombard and the Summa theologiae. While focusing on the traditional and innovative aspects of Thomas’s liturgical thought within his 13th century context, these lectures aim to help us to enter more deeply into the liturgy as experienced in its various forms today. The first lecture takes place at 1:00 pm, the second at 2:30 pm, and Mass will be offered at 3:45 pm. Refreshments will be available before the first and second lectures. 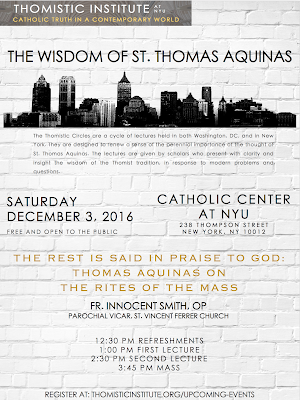 The event will take place at the Catholic Center at NYU (238 Thompson Street, New York, NY), and are part of The Wisdom of St Thomas Aquinas series sponsored by the Thomistic Institute at NYU (thomisticinstitute.org). To register for the lectures, which are free and open to the public, visit thomisticinstitute.org/upcoming-events.